Both formal and informal approaches apply when anyone explains the types of butterflies native to the world’s fields, forests and residential areas. Informally, butterfly species present themselves as the colorful, winged insects associated with flowers and warm, sunny days. Check out the video clip of the Ruddy Daggerwing butterfly and relive one of the sunny days. Feeling refreshed? Now back to the more formal butterfly discussions. At a young age most people learn that butterflies and moths belong to the larger Lepidoptera order. Families follow orders and the butterfly families often get organized based on a set of shared physical characteristics such as wing color or shape. The global butterfly population currently consists of six families, with experts identifying anywhere between fifteen to nineteen thousand different species. Butterfly diversity reaches its high in the area from Mexico to the southern tip of South America. 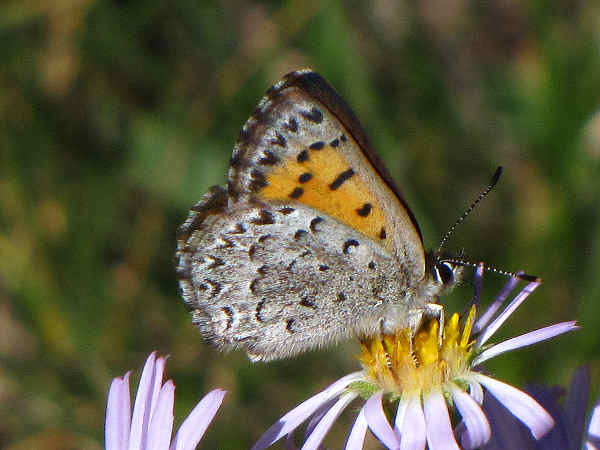 The butterfly identification guide provides pictures and descriptions of species from each family to help answer some basic butterfly identification questions. It might be helpful to use it in conjunction with the state butterfly guides. They provides lists of butterflies along with pictures of representative species of butterflies from each of the families. The brush-footed butterflies (Nymphalidae) constitute the largest butterfly family, accounting for approximately thirty percent of all North American butterfly species. Formally divided into eleven subfamilies, their common names such as admirals, fritillaries, checkerspots, ladies, crescents, commas and tortoiseshells ring a familiar note for most butterfly enthusiasts. Brushfoot butterflies account for the majority of the types of butterflies seen in gardens across the United States. Identifying them often starts by noticing the orange wing color. The picture at the top of the page, for example, shows the California Tortoiseshell, a common western species. From wing color, the identification process proceeds by closely examining the wing patterns necessary for proper identification. Monarch Butterflies, Queens and Soldiers, for example, similar looking species in the danaus genus can be distinguished from each other by their wing patterns. 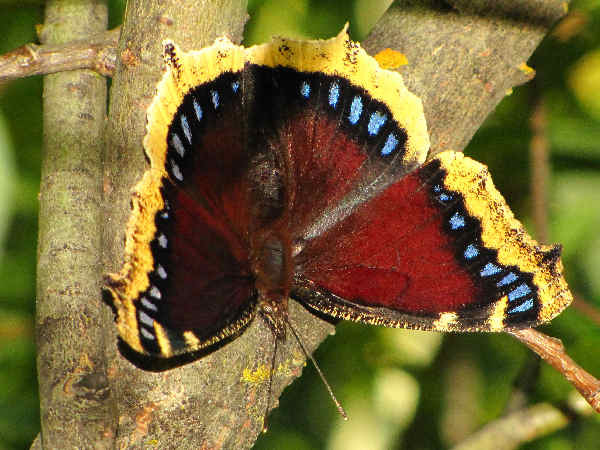 The picture shows a Mourning Cloak with its brown and yellow fringed wing color, making it one of the families color anomalies. Press the button and discover the basic wing patterns associated with all the brushfoot butterfly subfamilies. Gossamer-wing butterflies, generally small in size, initially get grouped according to both color and wing appendages. Lycanidae subfamilies, for example, go by the common names, blues, coppers and hairstreaks. Blue butterflies (Polyommatinae), for example, share the physical characteristic of males having blue wings. Wing color of females differs from blue to brown, depending on the species. Often identification of blue butterflies begins with a close examination of the patterns present on the underside of the wings. Click on the blue butterflies link to view a video that shows a handful of blue butterfly species with the wings folded, highlighting those patterns. The thin, tail looking appendage on the bottom of hairstreak butterfly wings, on the other hand, usually serves as the physical characteristic uniting that subfamily. Of course, the tail looking appendage for hairstreaks represents one rule of thumb. The colorful green hairstreak butterfly in the video Copper butterflies tend to have brown to copper shaded wings. 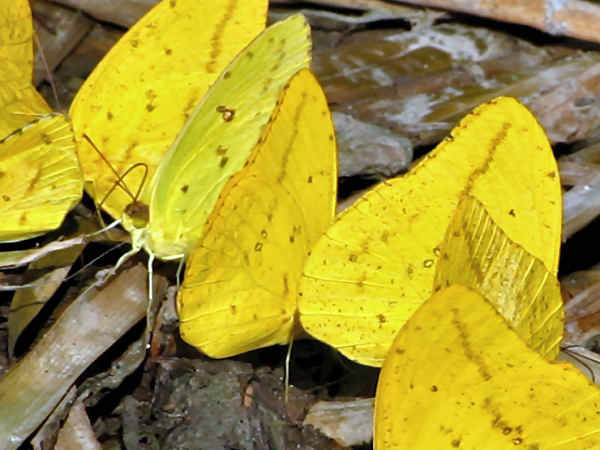 The white and sulphur (yellow) butterflies (family Pieridae) easily spotted in the field, initially get identified and sorted into the family on account of their wing color. One of the most common white butterflies present in North American yards and gardens, the Cabbage White butterfly, raises young that feed on garden vegetables. Common names for Pieridae species include marbles, orangetips, yellows and dogfaces. The approximately seventy documented species makes it one of the smaller butterfly families in terms of species diversity. 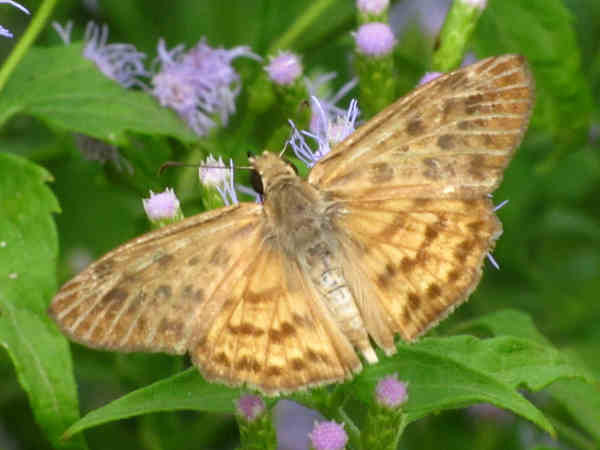 The skippers (family Hesperiidae), the small brownish butterflies, also get characterized by their relatively large eyes and closed wings at rest. Spreadwing skippers expand on that starting point. Still small and often with brown color wings, they tend to rest with wings open. Sometimes mistaken for moths, their clubbed antennae help identify it as a butterfly. Common names for Hesperiidae species include longtails, flashers, cloudywings, flats, sootywings, duskywings and skipperlings. Swallowtail butterflies (family Papilionidae) the dominant Papilionidae subfamily, can often be recognized by their larger than average size and the presences of extended appendages (tails) at the bottom of their wings. 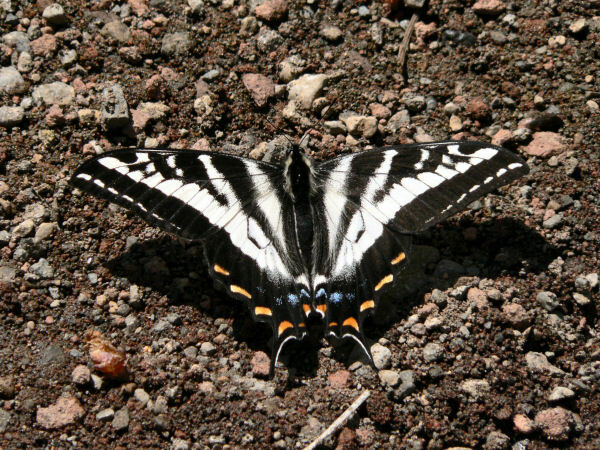 Many, but not all swallowtail butterflies have black or yellow patterned wings. Species diversity reaches it highest in the South. 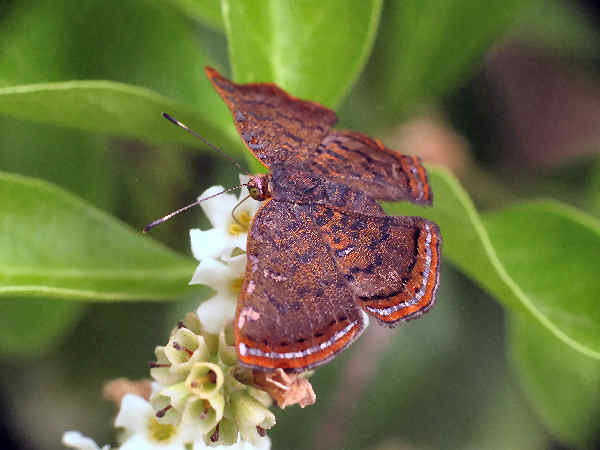 Because the Riodinidae family species, commonly called mmetalmarks, are primarily a tropical family, many butterfly fans tends to forget they exist. However, a small group of species populate areas along southern North America, especially the Southwest. Regardless of questions related to identifying different types of butterflies, most butterfly enthusiasts also share an interest in common butterfly questions. Here’s some quick takes on very common butterfly questions. The question of the butterfly diet is very popular, and relatively simple to answer. In brief, most butterflies do not eat anything, although they do drink liquids. While butterflies do not eat in the traditional sense, they have a proboscis, or long tube in their mouth that acts like a straw for drinking. Their tastes tend to be eclectic, with many opting to perch on flowers, manure piles and fruit gathering different nutrients. Another common butterfly behavior called puddling refers to butterflies that congregate in shallow water or wet areas to grab a drink on a warm sunny day. 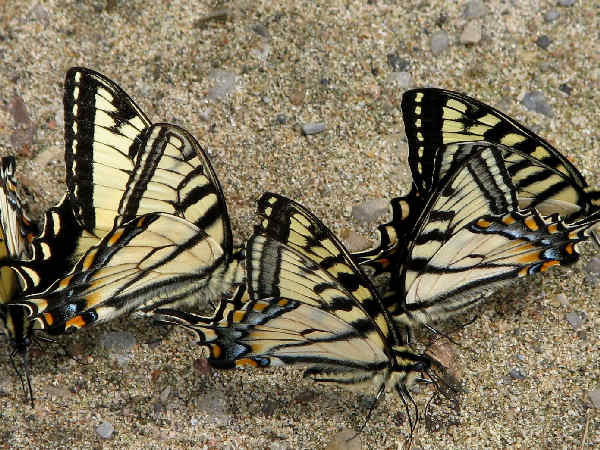 The top picture highlights some puddling butterflies. Butterfly photographers take note of potential butterfly puddling areas such as water patches in ditches on the side of the road because they are great places to find a variety of butterfly species. Knowing that some longwing butterflies can life up to six months naturally leads to the next question, how long do butterflies live. Well, butterfly life span can be measured two ways. The entire butterfly life cycle, from egg to larvae to pupa to adult can span a few months to a year, depending on the species. Adult life spans also differ from species to species. Some species such as Monarch Butterflies and Red Admirals are known for their long migrations. Newly hatched adults fly great distances to overwinter in warm areas, prior to flying north for breeding season. Generally the long distance migrating butterflies can live for an entire year in order to complete the life cycle. At the opposite end of the spectrum, many butterfly species typically live a week or two, usually a sufficient amount of time to mate and produce a new generation. Taking notice of the butterfly species in one specific area over the course of the spring, summer and fall months, usually provides more specific information on the life spans of the native species. Some species produce only one brood of young during the course of a year, while other species produce multiple broods. Over the course of a couple months investigation, the careful observer often discovers that a group of butterfly species tend to appear, only to be replaced by another group of butterfly species one month later. How did butterflies get their name? Butterfly enthusiasts across the United States recognize many species, such as the Zebra Swallowtail, Texan Crescent and Common Buckeye, by their English names rather than their scientific names. How did butterflies get those names, and, who names them? The short answer to the first part of the question is butterfly marketing. Butterflies get their common names as part of a butterfly promotion effort. In 1874, one of the leading entomologists of the day, Samuel Hubbard Scudder, proposed a system for naming butterflies that would appeal to the average American. In our own country all the common birds and flowers have also received such names, and it is my belief that the study of butterflies would be far more popular, if they also had common names. Since 1874, approximately 750 different butterfly species have been given common names, based primarily on the butterfly’s physical characteristics or geographical location. As the number of still to be discovered butterfly species decreases, the butterfly naming competition heats up. In 2007, The University of Florida held an auction for the rights to name a newly discovered owl butterfly species. A winning bid of $40,800, was received to name the butterfly the Minerva owl butterfly, in memory of Margery Minerva Blythe Kitzmiller of Ohio. The proceeds of the auction help fund continued research about butterfly species in Mexico. Butterflies are fragile insects that typically fly during warm, sunny days. Watching butterflies during times when the sun comes in and out of clouds leads to the discovery that they often sit still, or disappear during cloudy periods. Because of their fragile wings, in rainy times, butterflies seek shelter. Sometimes the shelter can be as simple as heading to the closest tree and folding their wings. Other butterflies might hide under branches or the overhanging areas of roofs.